It's not often that an opportunity arises to get up-close and personal with some of the leading practitioners from within the music industry. Last year, Tony Hobden, a lecturer teaching on the Music Production Degree at Weston College, began a series of 'An audience with' style interviews with current artists, engineers and producers to not only aid in the delivery of the courses at the college, but also as the start of a series of interviews in which industry techniques and stories can be shared with the students and, ultimately, within the public domain. "Having worked within the industry for two decades, I have found that much of what I have learnt, and am still learning, comes from the experiences of others who I have had the pleasure of working with," says Tony. "Music education needs to be relevant and delivered alongside contemporary practices backed up by real-world experiences. Our guests not only inform but also inspire our students by way of these interviews, and they always have time for a coffee and a chat with those who have more specific questions." Guests have included the likes of Clive Deamer, an independent session drummer/percussionist and the backbone of two of the most influential British albums of the '90s, Portishead's Dummy and Roni Size's New Forms (both winners of the Mercury music prize). He was more recently recruited as Radiohead's auxiliary drummer for the King of Limbs DVD and 2012 world tour. The series also features an exclusive interview with the legendary John Cornfield, who agreed to this rare activity during a recent student residential to Sawmills Studios in Fowey, Cornwall. John mixed and produced bands such as New Model Army, Supergrass, Catatonia, Razorlight, Muse, Wet Wet Wet, Robert Plant, Stone Roses and Ride, and has therefore been responsible for many chart successes. Record producer Greg Haver is also featured. Greg is best known for his great work with the Manic Street Preachers, but has also worked with Mel C, Catatonia and The Super Furry Animals. 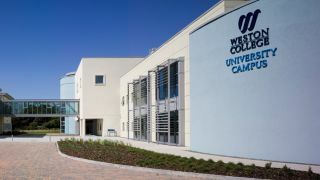 To get access to exclusive interviews and invitations to future events in the series, head over to the Weston College website.